No. 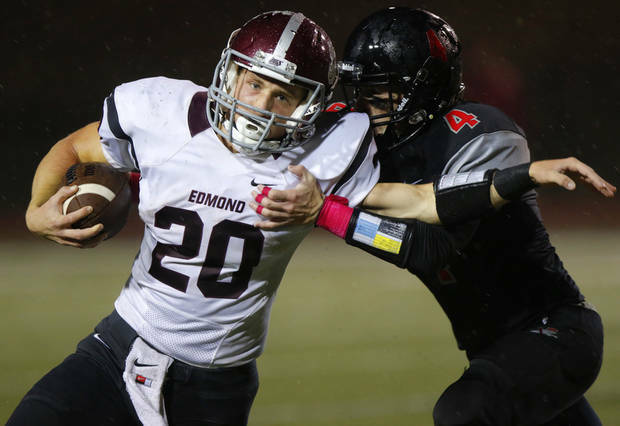 10 Edmond Memorial is now 4-4 on the year overall, but more importantly 3-2 in District 6A-I-1 play entering the final two-game stretch against Jenks and Broken Arrow. The victory keeps hope alive moving forward. MOORE — Delvon McNeely fully expected to get yelled at by the Edmond Memorial coaches on the sideline in the final minute. McNeely, a sophomore running back, had just made the one mistake on a career night, fumbling with 45.7 seconds remaining and Memorial clinging to a seven-point lead over Westmoore. What he expected didn't happen. Instead, coaches acknowledged his big night and the defense saved the day in a huge 20-13 victory to keep Memorial's playoff hopes alive Thursday at Moore Schools Stadium. "They said you did good today and worked hard," McNeely said while boasting a huge smile. "This is a really good relief that we got this win," Memorial quarterback Jonah Weltzheimer said. "Our focus is the playoffs right now, and we put so much time and effort in this week preparing. I think all of that hard work paid off for this game." No. 8 Westmoore falls to 3-5 overall and 2-3 in district play. The Jaguars are still in the playoff hunt with games against Yukon and Putnam City remaining. On a night where the Westmoore defense swarmed senior Tate Troxell in the backfield and held him to a mere 14 yards on 13 carries, it was the powerful McNeely who stepped up. He carried the ball 22 times for 125 yards and a touchdown, a 3-yard run in the first quarter. He rushed for 98 yards in the second half once the rain subsided. "Just through the weeks he's played he's gotten so much better," Weltzheimer said. "Last year, he was known as that run-hard player, but he's developed a quickness in him. That's our key is quickness with our running backs. He helped us so much in this game. He says he had a bad game, but he had a great game for us today." Memorial led 13-3 early in the fourth after Braxton Pickard made his second field goal. Westmoore immediately answered with a 63-yard kick return from Wyatt Duvall that set up a 17-yard touchdown reception by Mike Hotchkins. The Jaguars then tied the game on a 22-yard field goal by Javier Aguilar with 4:42 left. Memorial, however, quickly drove down the field to set up Weltzheimer's 7-yard keeper for the go-ahead score. "I'm so proud of Jonah," Memorial coach Justin Merideth said. "Being the backup quarterback to come in and lead us to a bunch of wins, I'm so proud of him." The Bulldogs' defense stopped Westmoore on downs the next possession and on the final possession after McNeely's fumble to seal the much-needed win. "I hoped our defensive would help me out," McNeely said.